This route duplicates the final two climbs of stage 17 of the 2016 Tour de France. Simon posted a comment describing how great this route was. Thanks! That was all the motivation I needed. Biggest climbing day of the year so far — taking full advantage of the current heat wave. 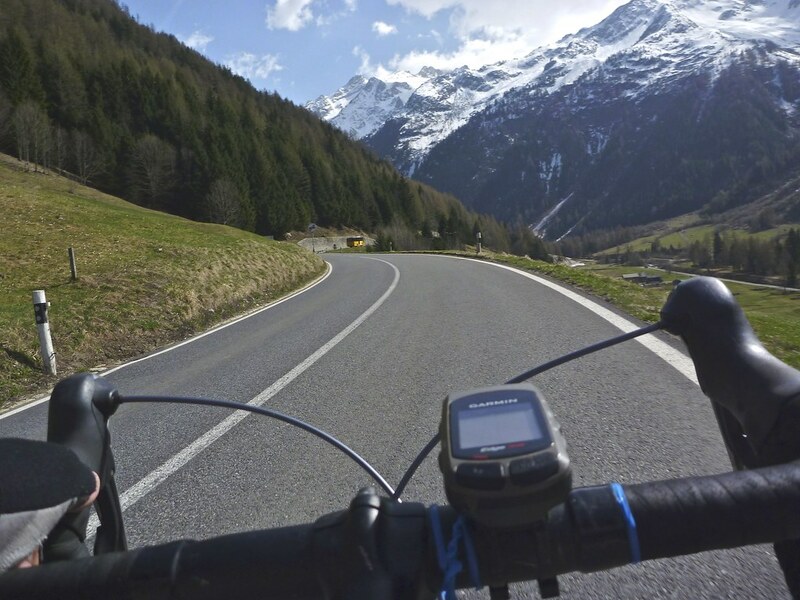 This was my first time doing the hard side of Col de la Forclaz – you can also approach it from Chamonix via Col des Montets. Starting in Martigny, it starts by climbing up through the vineyards. Beautiful. 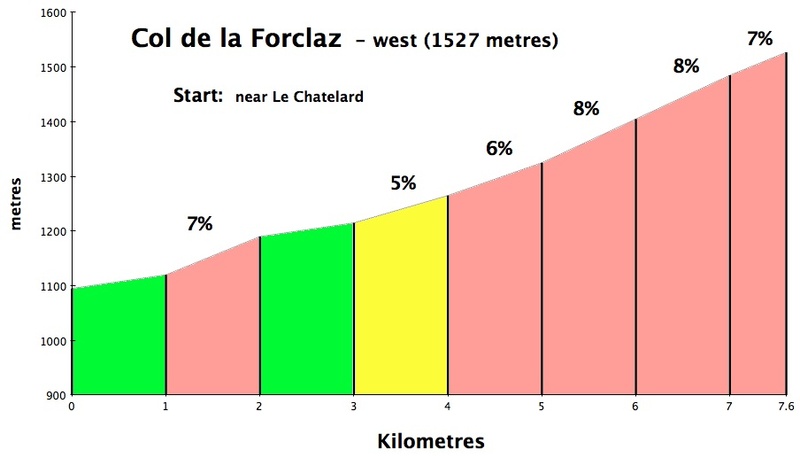 Forclaz means “narrow gap.” There are several other Col de la Forclaz in the north alps. 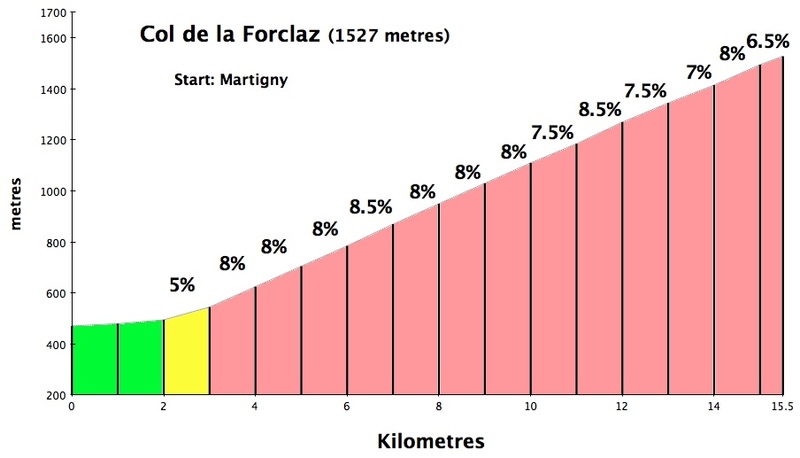 2 great climbs for cyclists: see Col de la Forclaz de Montmin and Col de la Forclaz de Queige. Climbing Forclaz there are two long straight stretches (see map) that look less steep than they are …. after a few hard days on the bike recently, I found it hard going. As the 1st elevation profile above shows … it’s a very steady 8% climb. After reaching Col de la Forclaz and descending to the base of Emosson I almost turned around. I was tired and an extra 900 metre steep climb seemed a silly idea. 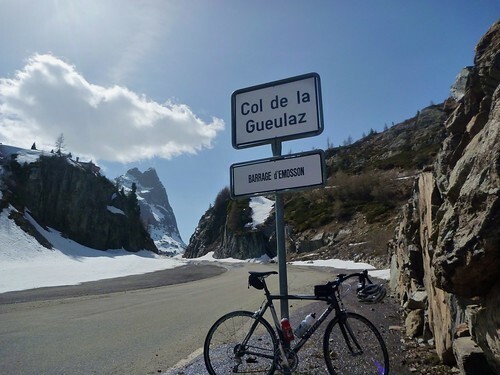 But on such a nice day and such a stunning climb I decided …. one kilometre at a time … and slowly I started feeling better. This is a steep, crazy climb up the side of a mountain … with views of huge Alps to the south throughout. 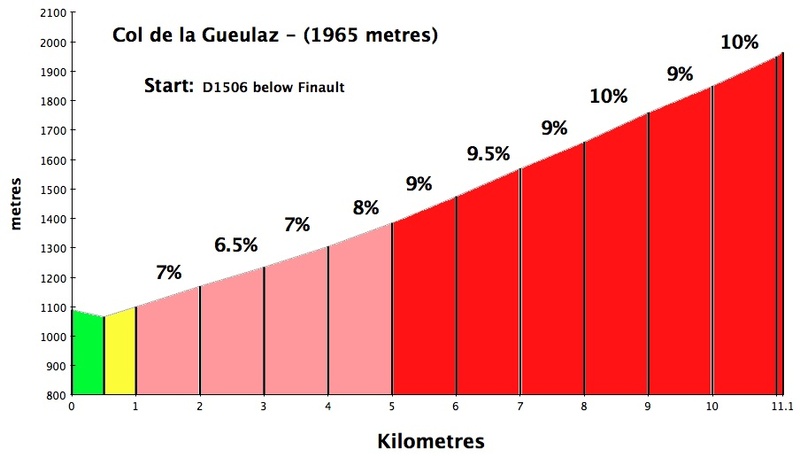 The highlight is passing through Col de la Gueulaz and reaching the dam. It is one of the most beautiful places I know in (beautiful) Switzerland. But it looks a lot different this time of year as the snow hasn’t melted and filled the lake. 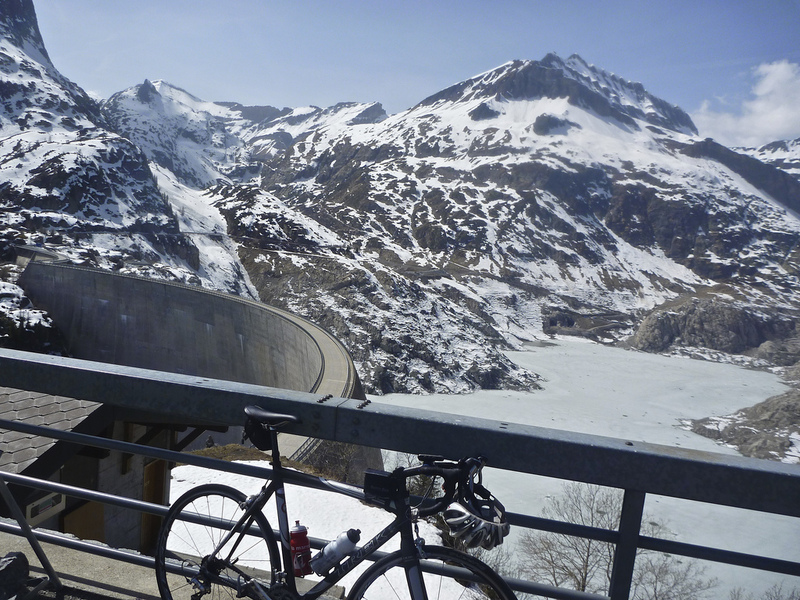 In summer, you can cycle across the dam and then go higher on an astonishing road up to a smaller lake/dam: see here. 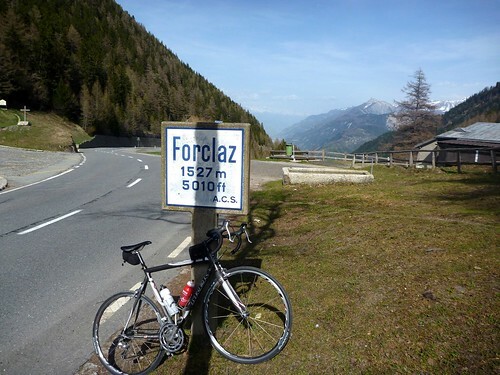 Finally, after descending, I had to cycle back up the easier side of Col de la Forclaz to return to Martigny. Not too hard (see profile above), but really a lovely little climb. A truly dream route. Thanks Simon for the tip/nudge. Steep ces deux cols ! Bravo, toujours un beau coin ! It’s amazing that such a high road is already virtually snow-free. Hey Chris, thanks for that and great photo. Yeah, it’s amazing how warm it’s been. I have noticed that route and now will try it thx – looks fun. Have you ever tried up to the little barrage Lac de Salanfe nearby? It looks steep but with a road when looking at Satellite images. I really appreciate the route idea! PS- are you doing the Maratona again this year? Hi Will, we’re not planning on doing the Maratona this year. 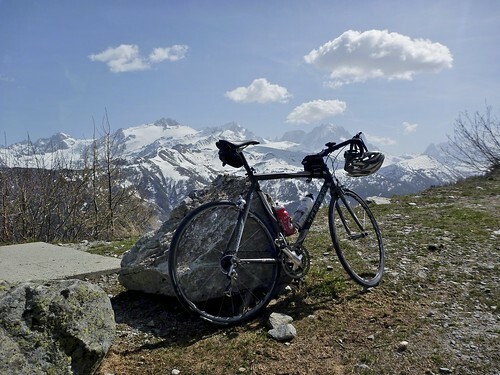 As for the Lac de Salanfe, I have ridden it and my map suggests that it’s a pretty marginal road up to there, but it might be rideable. 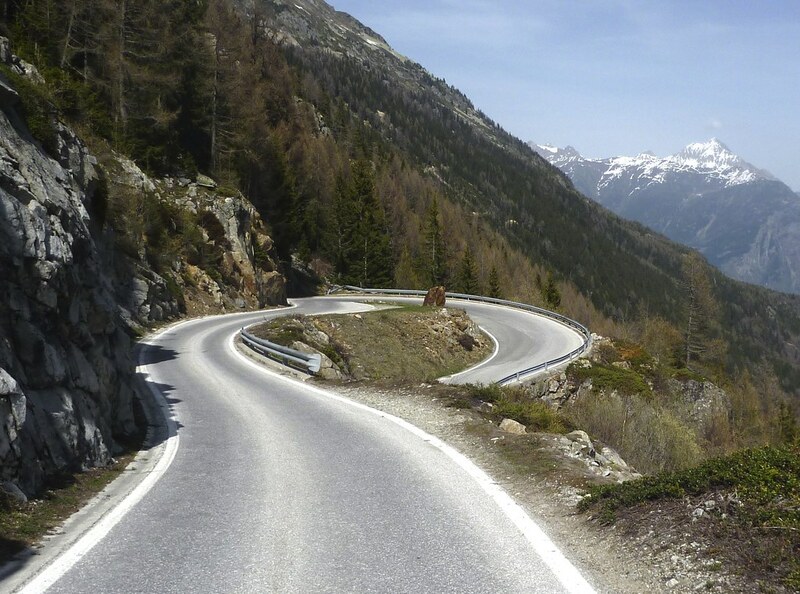 At an other source I found that the road to Emosson can be closed for traffic. Didn’t you have a problem ? So by bicycle can it be ridden without any problems ?